Kids will have fun learning with this colourful activity toys. 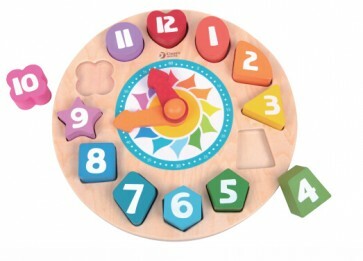 Tic Tac by Classic World is an educational clock toy for children to learn about time, colors, numbers, hours and minutes. This tic tac clock provides many activity for children. - Sort and match the puzzle shapes. -Move the clock to show the time what children usually do at the point time. - Recognize and identify the number, colour and shapes. Made of wood with non toxic child safely finishing materials.